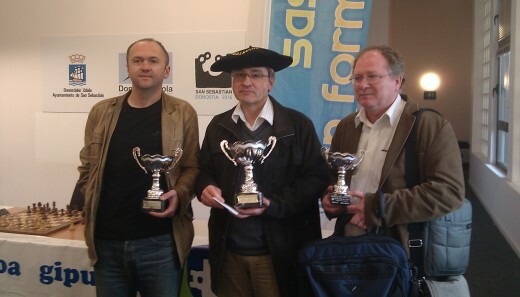 The 35th San Sebastian City International Chess Tournament took place from 31st March to 7th April at the Gros Xake Taldea. Anoeta passeig, 20. Donostia – San Sebastián (Frontón Karmelo Balda). Czech Grandmaster Igor Rausis defeated French IM Cyril Marzolo in a nice tactical game in the final round and took a clear first place with 7.5/9 points. Rausis is awarded with the top prize of 1500 EUR and the traditional Basque hat Txapela. GM Marko Tratar tried hard to take an advantage of the white pieces and catch Rausis on the first place, but the legendary GM Oleg Romanishin defended well and the game ended in a draw. Tratar shared 2-7th place, but on tie-break finished 2nd. Third is GM Kevin Spraggett, regular participant in the San Sebastian tournaments. FIDE Masters Paul Velten and Juan Ignacio Alonso had a fantastic performance to both finish with 7 points and earn IM norms. In addition, Alonso takes the prize dedicated to the best local player.